Dark navy leather deck shoes with laces and rubber soles. No original box. 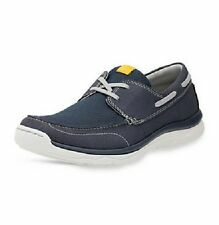 Mens Clarks Morven Sun Navy Suede Loafer Boat Shoes Size. Dispatched with Royal Mail 1st Class. Men Clarks Navy Blue Leather Laces Deck/Casual Shoe Size 7 UK VGC!! These shoe been worn still in very good condition as you can see from the photos. They are perfect for dressing up with many style, for special occasions,formal,casual,party,work,and perfect for any occasions. Clarks Morven Sail deck shoes. British Tan Leather. Size 7.5 G.
Brown Leather Uppers. Size UK 9 G. Leather Laces (may need new laces). Leather Insole. Great design and very comfortable good quality shoes. Colour : blue. Size: UK 10 EUR 44. We will do our best to resolve any issues swiftly. CLARK'S Brown leather MEN'S soft CUSHION with ortholite shoes size UK7. Men's Brown leather Clark's soft CUSHION with ortholite shoes size UK7 A nice pair of shoes with VERY SOFT LEATHER. In good condition and look very casual. FOR SALE IS A DARK NAVY BLUE LEATHER BOAT SHOES / DECK SHOES. IN THE SIZE UK 8 ( 42 ). AS SHOWN IN PICTURES. OVERALL IN GOOD CLEAN CONDITION. Clarks Mens Boat Deck Shoes FULMEN ROW Dark Brown Leather UK 11G DESCRIPTION Uppers: Leather Lining: Unlined Sole: Rubber Fit: G (Standard) Fulmen Row, men's boat shoe - Going nautical this summer, then complete your look with these deck shoes from our latest men's collection. Using the moccasin construction and crafted from rich, dark Brown leather, this style is timeless and will transcend the summer seasons. With breathable leather linings, these slip-on shoes are comfortable enough to be worn barefoot. Mens Clarks Leather Boat Shoes Size 9. Condition is Used. Dispatched with Royal Mail 2nd Class. Comfy shoes by CLARKS. Deck/Moccasin styled shoes in beige. leather upper & lining. lace up shoes with thread design. Leather Boat Shoes Deck Shoes Blue, Size UK 11 G by Clarks, Good used condition. THIS IS A LOVELY PAIR OF BLUE LEATHER DECK SHOES WITH WHITE STITCHING BY CLARKS. THEY HAVE BEEN WORN BUT NOT EXCESSIVELY AND ARE IN VERY GOOD CONDITION. STILL VERY CLEAN AND TIDY INSIDE AND OUT. DESCRIPTION Uppers: Leather Lining: Unlined Sole: Rubber Fit: G (Standard) Fulmen Row, men's boat shoe - Going nautical this summer, then complete your look with these deck shoes from our latest men's collection. Using the moccasin construction and crafted from rich, navy leather, this style is timeless and will transcend the summer seasons. With breathable leather linings, these slip-on shoes are comfortable enough to be worn barefoot. These shoes are ideal for work or casual wear. size uk 8. A high quality / robust / comfortable pair of boat shoes. Classic colour. Made with premium nubuck leather. Siped rubber outsole for maximum traction and durability. Fantastic shoes byCLARKS. Neave - Faye Fashion. Width - D (Standed). Label size - 8. DESCRIPTION Uppers: Leather Lining: Unlined Sole: Rubber Fit: G (Standard) Fulmen Row, men's boat shoe - Going nautical this summer, then complete your look with these deck shoes from our latest men's collection. Using the moccasin construction and crafted from rich, dark Brown leather, this style is timeless and will transcend the summer seasons. With breathable leather linings, these slip-on shoes are comfortable enough to be worn barefoot. Genuine CLARKS. SIZE: 8.5 UK, 42.5 EU. Upper premium leather. Rubber sole. Boat/Deck style. Grab a bargain! Excellent Condition. Just a few very minor marks / scuffs. Very Little actual wear. Quality / robust shoes. Any issue will be sorted. This is a pair of Clarks Comfort Deck Shoes. They come in excellent condition. They are win mid brown leather, have rubber soles and are lace up. They are size UK 8 and the insole length is 27cm. They come from a smoke and pet free home If you have any questions please ask.